SKU: 50463. Category: 1920s, Decades, Sold Items. Tags: 1920s, Agatha Christie, Burgh Island, Downton Abbey, Hercule Poiret, Orient Express, The Jazz Age, vintage 1920s. A stunning 1920s Beaded Silk Dress! 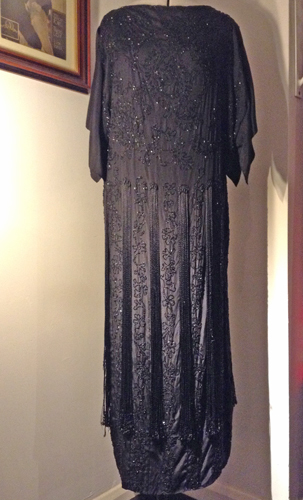 With her intricate beading and long tassels, this gorgeous dress is an iconic piece of Jazz Age fashion! Approx measurements: Bust 42 inches; Hips 40-42 inches. Length 51 inches. Similar to today’s UK size 16 but could also be ideal for the sized 14 Flapper! The dress has been measured flat across the back (underarm to underarm) for the bust size. The back of the dress is exactly the same as the front so those wonderful bugle beads will keep you glittering whichever way you glide across that floor. Fabric drapes down from the shoulders so if you’re conscious, as some of our customers have been, of your upper arm area, this provides a little cover. 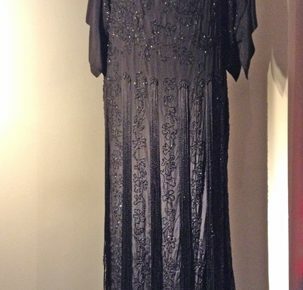 However, the beautiful design of this 1920s beaded black silk dress will dazzle any on-looker so I wouldn’t worry about your arms. Condition report: This dress has some wear but no more than one would expect with original vintage. I believe she dates from the 1920s so for a lady who’s nearly 100 years old I think she’s looking extremely good! Some beads are missing though it would be difficult to see as there are so many beads on this dress. 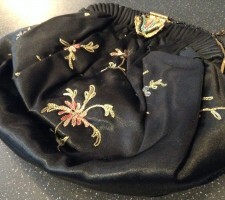 Some loose beads have been secured by a professional seamstress who also sewed up one side of the dress where the stitches had come away. In doing her repairs, our wonderful seamstress also noticed that the gown had been taken in. 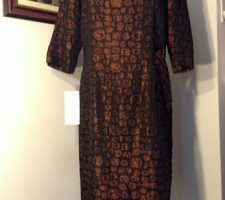 (This garment had been used by a Film and Television Costumier many years ago so this may have been why the gown had been altered). The dress has now been let out to her original size, as listed above. One or two tiny holes in the fabric that drapes over the upper arm and she may have lost one or two strands from the groups of tassels that surround the dress from the waist but not noticeable. You would feel very special in this spectacular gown. This beautiful 1920s beaded silk dress exudes the elegance and style of the Twenties, whether you prefer to Tango, Charleston or just sip your cocktail, glamorously, under the watchful eye of Hercule Poiret! Please note: with my limited computer skills I have lightened the photograph so that you could see the beads and tassel detail more clearly. If you fall in love with this dress – and who wouldn’t – you may like to know that we have a range of 1920s’ shoes so just email me if you would like to know if we might have something in your size.